The Curtain Fig Tree is an enormous strangler fig tree, one of the largest trees in North Queensland, and as fascinating as it is unusual. Situated on the Atherton Tablelands, a short drive from the historic town of Yungaburra, it is an incredible example of the power and unpredictability of Mother Nature. The tree is from the strangler fig species Ficus virens. These figs normally germinate on another tree and put all their energy into then growing roots down the host and into the ground. Once this is accomplished, the fig grows vigorously until finally kill the hosting tree. In the case of the Curtain Fig Tree, the host tree fell, landing on another tree nearby that was also overrun by the fig. The strangler vine continued to grow along the slanting angle of the leaning tree and establish an extensive aerial root system dropping 15 metres (49.2 feet) creating the ‘curtain’ that has made the tree so fascinating and unusual. Both hosts have long since rotted away, but not before the strangler fig grew along the oblique angle of the leaning tree. towards the next one; the fig also grows around that one. It felt almost prehistoric walking around the Curtain Fig Tree. It’s over 800 years old, stands 50 metres tall (164 feet), measures 39 metres at the base (127.1 feet), and accessible via a boardwalk that surrounds the tree so you can see it from every angle. There are two sections to Crater Lakes National Park. Lake Barrine and Lake Eacham . Both are volcanic crater lakes formed from a single, gigantic, volcanic explosion thousands of years ago, now filled with water and surrounded by rainforest. 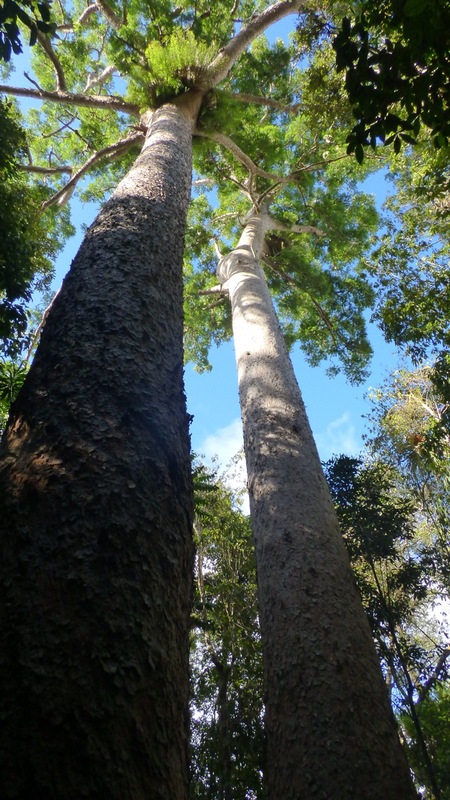 The park is situated on the Atherton Tablelands and the Twin Kauri Pines are found at Lake Barrine. 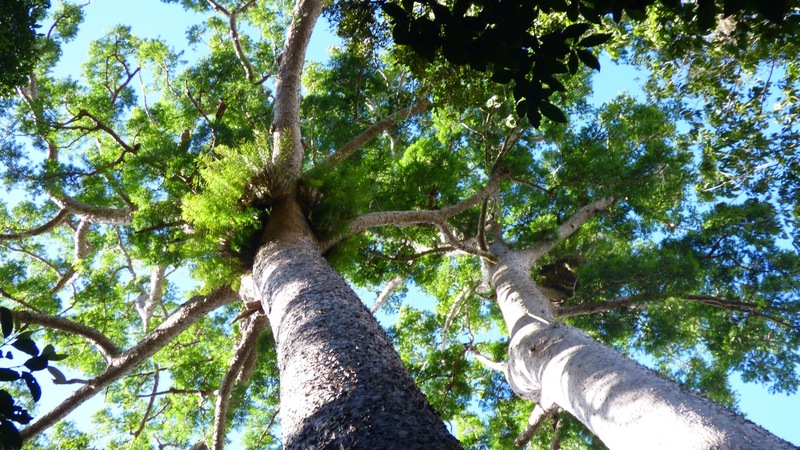 The Bull Kauri Pine (Agathis microstachya) is the largest pine of the 38 species found in Australia. These two were last measured at over 45 metres tall (147.7 feet), over 6 metres in girth (19.8 feet). They are believed to be more than 1,000 years old and tower over the canopy of the surrounding rainforest. We took the opportunity to enjoy the five kilometre lake circuit (3.1 miles). It was early, the air still brisk from the cool overnight temperature, and although the sky was a little overcast, it showed promise of fining up as the day grew older. It took us 75 minutes to walk around the lake, and was pleasant enough with the sounds of bird calls all around us. We then enjoyed a fabulous Devonshire Tea (aka Coffee) at the Lake Barrine Tea House. The coffee was good, and the scones were so yummy. The trees!! Oh the trees!!!!! I agree Linda – Oh the trees! They were a sight to behold. Hey Clare, those scones must have been good cause’ you didn’t mention the excellent view from the teahouse!!! You can only see a snippet from the picture of the scones – enjoy! I’m sorry, the view was good, but all our focus was concentrated on those scones. You had me at trees! I love trees of all kinds. That first one was weird, though! You are funny Calen, but yes, the Curtain Fig is a little weird.